This week I was really excited when my friend Melanie sent me a photo of a sad little question mark folder on the boot up screen of her mid-2012 MacBook Pro. 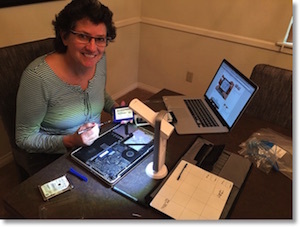 I was excited because Steve got me the 70 piece iFixit Pro Tech toolkit for Christmas and I was itching to use it! I made the appropriate sad noises to her and had her bring it over. She was willing to buy a new laptop if needed (she thought it was older than it is). It was pretty obvious that the simple problem was that her hard drive had died. I said to her, “You HAVE been running your backups, RIGHT?” To which she replied, “Yes, only 28 days ago! That’s really good for me.” Oh well, no tragedy in her book I guess. She also told me that the machine had been running really slowly. I suggested that instead of putting in another spinning hard drive, I’d put in a Solid State Drive. She told me that I was authorized up to $600, and I assured her I could put in a 500GB SSD for under $300 and she was delighted. I loaned her an older Macbook I had lying around (that amazed her that I had an extra computer and sent her on her way. I bought her the 480GB OWC Mercury Electra 6G SSD and selected next-day shipping. Out the door, $277.34. Then it was off to iFixit and OWC to find out how hard this swap of the drive was going to be. Sadly, it’s a really really easy repair. You take the back screws off, lift off the back, unplug power to the battery, take out 2 screws that hold in the drive, and unplug the drive from the cable. Luckily the four little standoff screws on the drive are Torx 6 so I did get to use that AND a small philips from my iFixit kit with their awesome driver. Oh, and a spudger from the kit as well. I think my total time round trip was maybe 15 minutes. Reversed the procedure to button it back up. I knew when I booted that I’d have to go into Recovery mode because the SSD didn’t have an operating system on it. No problem, command-R on boot, go into Disk Utility to format the new drive…and it’s not there. Wait, what? How on earth could that be? Next I connected a lovely little external SSD that George from Tulsa gave me that had Yosemite on it and booted the Mac externally and again, no internal drive showing in Disk Utility. Then I had an awful thought, what if it WASN’T the drive? I connected the old hard drive to the Mac using an external cabling setup, and it spun up like a champ and was completely fine. Well now, that’s baffling, what the heck is wrong if the drive is fine, the Mac is fine because it boots just fine from an external drive and the recovery partition? Time to head to the Googles. I searched on “MacBook Pro won’t boot from internal drive” and found an Apple Discussion Forum with 124 responses across 9 pages where people were reporting that the hard drive cable can actually be at fault. I thought that sounded like hooey, how could a cable go bad? There’s no moving parts, no way any dust or dirt could get into a connector, no way that it’s getting flexed, it’s impossible. But there’s 124 people talking about it. I looked up the cable, found it on Amazon for a mere $30, so I threw in $5 shipping to get it same day. And…it WORKED. Immediately her Mac was up and humming along with the old Hard Drive. I figured since she said her Mac was slow ANYWAY, and she’d been willing to drop $600 on fixing it, she wouldn’t mind keeping the sub $300 SSD. Popped that in, formatted it, installed OS X on it and then migrated her user right over from her old hard drive. I am absolutely baffled to this day on how a cable can go bad, but I figured I’d add my voice to the stories on the Internet so maybe I could save someone else a pile of money and trouble where a $30 cable can fix. Mysterious indeed. However I know one way such a cable can go bad, as I split one when swapping out a drive. Where is your grounding wristband? you could have staticly “let the magic smoke” out of the computer without it. This is a laptop. 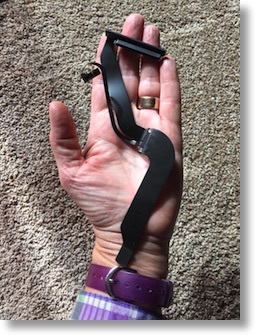 A device that gets bumped, dropped, jostled, etc. No, you’re not pulling and yanking on the cable; but the constant bumps and vibrations can wear down cables. These ribbon cables are notorious for being very delicate and easily damaged. They also use little tiny connectors with tiny little solder joints, one of which could have easily failed due to the aformentioned minor vibrations, or because it was improperly done (cold solder joint), or any of a number of other reasons.